€3 nominal fee or free for Oberstdorf visitors with an Allgäu Walser Premium Card! Dear Oberstdorf holidaymaker and winter enthusiast, What makes the perfect winter’s day for you? Perhaps trees draped in snow like a scene from a fairytale? Or the white mountain peaks towering majestically into the sky? Or are sporting pursuits foremost in your mind and do you prefer optimally groomed pistes and cross-country skiing trails? The advantage of coming to Oberstdorf for a winter holiday is that you don’t need to choose one or the other! Because here, in the most southerly part of Germany, there is a long-­ standing tradition of winter sports and you will find everything you could possibly need for your ideal winter’s day. Skiers and snowboarders can enjoy 130 kilometres of pistes in five different ski areas, including Fellhorn / Kanzelwand, Germany’s largest cross-­ border ski resort. If you successfully complete the 7.5-kilometre valley run from the Nebelhorn summit, your thighs are sure to feel the burn of a fantastic cardio workout! Families, on the other hand, feel ­particularly at home in Söllereck, a family-friendly ski resort with a ski carousel and children’s practice area. OBERSTDORF ZOOM The app for direct access If you’re feeling “homesick” for Oberstdorf, our new blog may help quench your longing till your next visit! It covers everything from village news to historical and behind-thescenes insights. Read about living local customs and traditions, events, stories about local people and much more. Check out the blog at www.heimweh.blog. Conveniently transfer holiday information straight from the winter brochure to the Oberstdorf app on your smartphone. How it works: Download the Oberstdorf app free of charge from the App Store or Google Play Store, tap the ZOOM icon in the app and scan the selected barcode in the brochure. The app takes you straight to the desired topic and allows you to save the content for your next Oberstdorf holiday by tapping the heart icon. The cross-border ski resort and Germanyâ&#x20AC;&#x2122;s largest ski area offers fans of winter sports 130 kilometres of optimally groomed pistes on around 140 winter sports days between December and May. Thirteen kilometres of pistes await winter sports enthus­iasts in the Nebelhorn ski area. The Allgäu’s highest gondola lift transports skiers and snowboarders to an altitude of 2,224 metres here. At the top, impressive panoramic views of over 400 peaks await from the mountain station and the spectacular new Nebelhorn cable car summit restaurant 2224. The Nordwandsteig (north face walkway) is a breathtaking experience. Unlimited fun then awaits all avid skiers and snowboarders on the 7.5-kilometre valley run, the longest valley run in Germany covered entirely in artificial snow. Several ­different descents are available to freeriders and free­ stylers. A night in the IgluLodge is the perfect way to end an action-packed day on the Nebelhorn. With snowbikes, snow tubes and other popular sports toys to choose from, the NTC Park by the Nebelhorn’s Seealpe station is the perfect place for some fun even without your skis or snowboard. Numerous groomed winter hiking trails run around the foot of the Nebelhorn and Oberstdorf. Nature lovers and winter hikers can also explore the various side valleys around Oberstdorf. A varied, 2.5 kilometre long toboggan run awaits tobogganists and sled riders on the Seealpe in the Nebelhorn ski area. Fellhorn / Kanzelwand Welcome to the modern cross-border ski region of ­Fellhorn / Kanzelwand, where fun on skis quite literally knows no bounds – and even extends across two different countries. And the whole family can join in. The ski route from the Seeeck-Bahn valley station to the Höfle station of the Fellhornbahn cable car has been given a complete overhaul in time for the 2018/2019 season. It now offers a 3 kilometre long blue family piste from the Fellhornbahn’s mountain station to the Höfle station. With state-of-the-art snowmaking equipment, the area ­offers pistes for every taste with snow practically guaranteed. Enjoy two valley runs of over four kilometres, mogul pistes, the Fellhorn fun slope (Germany’s first slope of this kind) as well as the “Easy Fellhornpark” (snow park). The skiing fun doesn’t stop when the sun goes down. One of the major highlights is night-time skiing at the Kesslerlift. Join in the after-dark fun on the torchlit descent every Wednesday from 7 p.m. to 9:30 p.m. Further highlights include groomed winter hiking trails, the Bergschau 2037 in the summit station, the Talschau with information about the Allgäu mountains and animals, as well as mountain restaurants and terraces with free deckchairs. ­ rogression simple. Söllis MiniPark and a monster parcours p provide plenty of fun along the piste, while the year-round SölliBully playground invites kids to climb and explore. You can’t help but love the Allgäu Coaster, a year-round ­toboggan run on rails. The Schönblick mountain restaurant tends to all your refreshment needs with plenty of ­Allgäu specialities, as well as a huge sun terrace and free deckchairs. hearts race as they shoot down the Burmi run. Safe ­w inter hiking trails wind their way through the snowy mountain landscape, inviting you to relax and enjoy the spectacular views. Formerly a well-kept secret, this charming area now ­impresses with numerous ski facilities, and is gradually developing into a premium ski area for the whole family. With the construction of the new six-seater Olympiabahn chair lift, with heated seats and a bubble for protection against the weather, the 10-seater gondola lifts Ifen I and Ifen II and ultra-modern snow-making system, Ifen has awoken from its long beauty sleep to become a premium family resort. Whether beginners or pros, Ifen offers the perfect descent for everyone. The fully refurbished mountain restaurant also invites you to stop for a break. Delicious organic and regional specialities are served here in a tasteful ambiance. Dining on the mesa “Tafel & Zunder” is the new name that has been given to the former “Hahnenköpfle” restaurant, which has also taken on a new lease of life. It now offers exceptional organic and regional dishes, professionally made from local ingredients. The new name also hints at the restaurant’s regional focus – even if you need some d ­ etailed knowledge about the mountain’s geology to r­ ealise it: the word “Tafel” is not only the German term for a long, festively laid out table, but also refers to the ­distinctive Ifen mesa, or table-top plateau. You want to check the weather forecast or quickly post another selfie before your descent? No problem! Free WLAN is available at all our main cable car stations and in the new 10-seater gondola lifts, the Ifen I and Ifen II. This service is also provided in the cable car restaurants. Simply select the “Bergbahnen free” WLAN network, open your browser, click on “Go Online” and confirm that you accept the terms and conditions. Share your experiences on the piste! Morning ski pass for use up to 12:30 p.m. Afternoon ski pass for use as of 1:30 p.m.
* Only the time-limited ticket for “all areas” is refundable. purchasing a discounted pass for kids, teens, students or seniors. Daily/multi-day passes Daily and multi-day passes are issued on chip cards with a € 2 deposit. Extending your ski pass You can extend your ski pass once a period of eight days has elapsed. Multi-day passes can only be used on consecutive days. Only selected-use passes can be used on non-consecutive days. Group rate/reductions Group/youth group prices: Available at the payment desk subject to special conditions (for groups of 20 or more, the group price only applies if all members of the group purchase the same ticket type). Surveillance photography At all checkpoints in the ski area, photographs are taken for surveillance purposes and are stored in compliancewith general data protection regulations. Glide through the snow on cross-country skis while enjoying the spectacular winter landscape. Crystal-clear air, snow-­ covered pine trees and meadows under a bright blue sky – Oberstdorf’s cross-country skiing trails are a particularly ­magical way to enjoy winter. i The cross-country skiing trails in Oberstdorf and the Kleinwalsertal Valley are naturally free to use. All routes are optimally signed. Cross-country skiing trails There are 75,000 metres of cross-country skiing trails around Oberstdorf, comprising ten perfectly groomed trails for you to choose from. In addition to multi-lane cross-country skiing trails in the middle of the v ­ alley, you will also find more remote trails for exciting ­journeys of discovery with the family. We have selected three cross-country skiing trails to tell you about in more detail. Tiefenbach circular trail Length: 4 km cross-country skiing trail / 1.5 km skating track Altitude metres: 56 m Location: Close to Tiefenbach, gently undulating terrain Grooming: The circular trail is freshly groomed daily as necessary by approx. 10:30 a.m. Depending on the weather, grooming may be delayed or cancelled. This moderately difficult circular trail will reveal to you an unseen side of Tiefenbach, a tranquil district of ­Oberstdorf, and its picturesque surroundings. If the snow conditions are good, the short circular trail initially proceeds from the foot of the Falkenberg ascent towards the St. Georg equestrian centre. After a short loop, it resumes its path along the bottom of the Falkenberg ascent, this time taking a higher route that looks down on the centre of Tiefenbach and takes you in the direction of the Rohrmoostal Valley. Here, the sun-drenched slopes invite you to stop and soak up the views across the hamlet of Reute and as far as the Oberstdorf Basin. The north-western edge of the circular trail, which is also its highest point, ­incorporates a manageable loop that is additionally groomed for freestyle skiing. Grooming: During normal winter weather conditions, this cross-country skiing trail is usually groomed daily at approx. 10 a.m. After a fresh fall of snow, the circular trail is always the first trail to be groomed. Depending on the weather, grooming may be delayed or cancelled. The circular trail follows a varied but easy route across the meadows and fields to the south of Oberstdorf, from the Walser Bridge to the Loretto chapels. Along the way, it regularly passes points near the centre of Oberstdorf, where you can choose to join or leave it. After passing the lovely St. Loretto pilgrimage chapels, the trail continues to the Renksteg area, offering spectacular views along the way. Here you will find the point where the route joins the cross-­country skiing trails that will be used in the upcoming FIS Nordic Ski World Championships 2021. Thanks to its convenient, e­ asily accessible location at the southern end of the village, the trail is definitely one of the most popular in Oberstdorf. The sun-kissed meadows to the south of Oberstdorf guarantee that you’ll be able to enjoy plenty of sunshine from the early morning until the late afternoon. Grooming: This trail is one of the first to be groomed daily at around 9 a.m. Depending on the weather, grooming may be delayed or cancelled. The southernmost cross-country skiing trail in Germany lies deep in the Stillachtal Valley and is a moderately ­difficult trail offering truly amazing view of the Allgäu mountains. This circular trail, with its spellbinding scenery, begins close to the Fellhornbahn valley station. From here, the trails climb gently upwards, passing the village of Anatswald and heading south. All the way to Birgsau, you will enjoy panoramic views of the Linkerskopf with its mantle of white and the surrounding summits of the ­Allgäu’s main ridge, blanketed in deep winter snow. Snow is pretty much guaranteed on this circular trail, which runs close to the main ridge of the Allgäu Alps. If access to the first trails around Oberstdorf is still restricted, you are certain to find better conditions here. It is also recommended that you plan to visit this trail in the late afternoon when it is at its sunniest. 1	As a sport, cross-country skiing is particularly good for you as it uses many different muscle groups. It is easy on the joints and not only works the leg and core muscles but also the often-neglected shoulders and arms. The “Zämed duss” (“Sharing the ­outdoors”) campaign subtly encourages people to treat one another with ­respect. It also aims to remind people that they are all out and about for the same reason: to enjoy nature. 2	By alternating between skating and classic style, you will activate even more muscle groups. 3. You furthermore stimulate your metabolism, strengthen your ­immune system and activate fat burning. 4. Cross-country skiing not only boosts your endurance but also requires and promotes good balance. 5	Cross-country skiing is also great for your coordination. You learn to move dynamically and economi­ cally – while also enjoying the ­exercise of course. 6. Exercising outdoors in the cold, in the natural winter landscape has great mental health benefits also. Anyone who is stressed and yearns to relax and recuperate should try cross-country skiing. The constant rhythm of movement through a peaceful wintry landscape calms the nerves and clears the head. 7. Cross-country skiing benefits the circulatory system. By doing a certain amount of cross-country skiing, you will also notice an improvement in your strength and endurance. Cross-country skiing and winter ­hiking offer plenty of potential for conflict. Cross-country skiing trails are intended for the exclusive use of cross-country skiers. Meanwhile, winter hikers can enjoy over 140 km of groomed winter hiking trails. If everyone sticks to the trails they should be on, no conflict should arise. We ask all owners to dispose of dog poo in the dog toilets provided. In winter, when temperatures remain persistently low, dog poo can remain ­preserved for weeks or even months, lying at the edge of trails for all to see. At the end of the day, we all want to share the outdoors for as long as possible. the ground, it had to be transported from higher-up regions to the valley in manure carts. The “Heimatmuseum Oberstdorf” (local history museum) has created its own small exhibition dedicated to the subject of winter sport on skis, which is currently on display in its rooms. Non-skiers will also enjoy a visit! You will find more information about the local history museum in Oberstdorf on page 43. Tourismus Oberstdorf organises a taster course in the Oberstdorf cross-country skiing stadium twice a week from about mid-December to mid-April, depending on snow levels. The taster course is run by the Oberstdorf ski schools. The price includes equipment hire and professional instruction. The taster lesson for visitors to Oberstdorf and locals. Shooting will be done using laser guns over a 10 m distance, from both a standing and a lying position. A realistic ­biathlon experience for all! The taster course is held once a week in the Oberstdorf cross-country skiing stadium from about mid-­December to mid-April, depending on snow levels. The price includes skating equipment and gun hire as well as professional instruction. P  ublic transport is available to and from the meeting point! Public transport is available to and from the meeting point! Did you know ... Around 17 sports shops in Oberstdorf currently sell cross-country skiing equipment. The world’s biggest ski boot had a shoe size of 450 and was made in Oberstdorf by ­Josef Schratt in 1929.
from Finland to complete the 50 km cross-­ country skiing event at the 2018 Winter Olympic Games. By comparison, the winning time at the 1930 German Championships was 5:26:38.
tion with snowcats are required to groom the cross-country skiing trails in Oberstdorf each year. In 1909, Elsa Vogler was the 1st female participant in the Allgäu Ski Championships in Oberstdorf. The alpine herdsman Ludwig Schwarz finished in 8th place in the 50 km event during the 1930 German Championships, even though he had never before skied such a distance (even during training). In 2021, the Nordic World Ski Championships will be held in Oberstdorf for the third time. The oldest ski in the world is around 4,500 years old and was discovered in Sweden. country skiing trails are available in the ­municipality of Oberstdorf every year. After a fresh fall of snow, it takes three workers around six hours to groom all slopes. That’s a total of up to 18 hours of work that has to be done each time it snows. Up to 150,000 volts of electricity are required to power one cross-country skiing season. An average snowflake measures no more than about 5 mm. Which makes it virtually impossible to ­imagine just how many snowflakes need to fall to produce a stable snow pack. There are 2,470 members in the Oberstdorf Ski Club. Wintertime and more One night free or a 15 % reduction on the standard winter accommodation price during the promotional periods 6 to 27 January 2019 10 to 31 March 2019 Visit in the promotional periods and receive 7 nights for the price of 6 or a 15 % reduction on the standard ­w inter accommodation price from all ­participating hosts. You can also avail of various exclusive offers at special prices from our local partners during the promotional ­periods – for example, why not book a carriage ride, a guided half-day winter hike, a cross-country skiing taster course or another of the many options available? Snow-covered valleys, deep blue winter skies and majestic mountains â&#x20AC;&#x201C; a picture-perfect, idyllic white scene. In the Oberstdorf valleys, winter really is as it should be. Enjoy the unique tranquillity found when the soft snow swallows almost every sound. Winter hikes galore With 140 kilometres of groomed trails, Oberstdorf has one of the largest winter hiking trail networks in the Alps and offers unsurpassed trail variety! Here, we ­provide you with a number of tips for hiking in winter. All winter hiking and walking trails in and around ­Oberstdorf can be found on our website at www.oberstdorf.de/winterwandern. ­ nsures that hikers will experience extremely fresh and e ­invigorating winter air. Starting in the small district of Hessenwinkel near Rubi, this varied hiking trail takes the meadow path in the direction of Oberstdorf. In the snow-covered meadows below the Rubihorn, winter hikers will frequently experience magical winter conditions, while enjoying glorious sunshine and stunning panoramic views of the Oberstdorf mountain backdrop. The Trettach, the Stillach and the Breitach, the three mountain rivers that flow around Oberstdorf, come t­ ogether at the source of the Iller. The return route of this winter hike brings you a little further along the Iller causeway, before re-entering Oberstdorf’s smallest district at the level of the Rubinger Steg bridge. Useful info: As the causeways are frequently difficult to groom, icy stretches may occasionally be encountered along this trail. For this reason, good footwear is essential for winter ­hiking. In certain cases, it may also be advisable to bring poles and grips. Panoramic hike to the Schönblick mountain restaurant Length: 5.5 km	Elevation gain: 358 m Duration: 2.5 hours	Location: At mid-altitude Starting at the bus station in Riezlern, the first few metres of the ascent will quickly take you away from the sounds of traffic on the main thoroughfare. Once you get past the ­upper limits of Riezlern, the path quickly but pleasantly gains altitude. When the last few houses are behind you, the trail takes you into the Schmiedebach gorge. The trail temporarily becomes very steep as you exit the canyon. If conditions are icy, it may be advisable to come equipped with poles or other equipment, such as shoe grips, to prevent slipping. On reaching the village of Oberwestegg, the trail winds its way steadily upwards on a gently climbing path. Here, the winter panorama stretches over the entire Kleinwalsertal Valley, all the way to the snow-clad Widderstein at the end of the valley. The views of the Hochifen and the Gottesacker Plateau – a geological jewel in the Alps – are equally breathtaking. Heading towards the trail’s highest point, the idyllic ascent takes you past picturesque alpine buildings till you reach the Alpe Schrattenwang above the Schönblick mountain restaurant. Here, you can stop to take in the stunning views of the southern Upper Allgäu and the Oberstdorf Basin. If you really want to push yourself, you can extend your hike at this point by heading to the Freibergsee Lake via the Hochleite plain or hiking down into the valley following a path parallel to the Söllereck cable car. Alternatively, you can relax and enjoy a comfortable descent in the Söllereck cable car. Tip: You can turn this winter hike into a day trip by combining it with a descent from the Schönblick mountain restaurant and following the Hochleite plain back to Oberstdorf. This is ideal for athletic hikers who want to test their stamina with a real winter challenge. With the sun in your face and the Allgäu’s main ridge in sight – a winter hike to the snow-covered Stillachtal V ­ alley has many attractions for you to discover! Over the panoramic meadows in the south of Oberstdorf and along the icy Stillach river, this winter hiking trail leads you to the Heini-Klopfer ski flying hill. Affectionately known as the “leaning tower of Oberstdorf”, the Heini Klopfer is open to visitors all year long. But be warned that the hill’s magnificent view of the frozen Freibergsee Lake and snow-­ covered Stillachtal Valley is not for the faint-hearted! of the Freibergsee Lake. From here, the sunny trail with its panoramic views heads back downhill, passing the Fellhornbahn valley station and Anatswald to Birgsau. If you’ve not yet had enough though, we recommend the climb through the mountain forests to Einödsbach. The hamlet of Einödsbach, which has been inhabited since the fifteenth century, sits in a picturesque setting at a height of 1,114 metres, directly below the main massif of the Allgäu Alps with its impressive summits of the Trettach, Mädelegabel and Hochfrottspitze. From this point, you simply retrace your steps back to Birgsau, where a regular bus service will take you back to Oberstdorf. winter, and on as far as the golf course. At this point, a short stretch takes you along the valley path, which is closed to public traffic, and past the Haseltopf snack bar to the Zwingbrücke Bridge. From the Zwingbrücke Bridge or, a little further down, the footbridge in lower Dietersberg, the winter hiking trail leads through Gruben back to Oberstdorf. Here, the landscape of the Trettachtal Valley, which is usually heavily blanketed in snow during winter, will leave a lasting impression. Back in Oberstdorf, the circular hike ends on the opposite site of the Mühlenbrücke Bridge. Tip: On cold winter days, when the ice covering the lake is thick enough, the Moorweiher Lake transforms into an ice ­c urling rink. Further information is available from Tourismus Oberstdorf. v­ illage, the trail briefly passes along a former cattle drive route, heading slightly steeper uphill to the valley station of the Söllereck cable car. After a brief stretch through a forest, the trail leads to the picturesquely located Bergkristall hut. The mountain ­restaurant of the same name that stood here in the 20th century was also a popular destination. Passing a pretty area where wild game are fed, the trail continues along the Bergkristallweg and the Waldesruhe back to Oberstdorf. Tip: The hiking distance can be almost halved by taking a bus to the Söllereck cable car station. Enjoy the many facets of winter in Oberstdorf away from the pistes and cross-country skiing trails. Head out into the snowy winter landscape for guaranteed fun for all the family. Plan your winter holiday in Oberstdorf in line with your specific needs. i Useful info The Breitachklamm sometimes has to be closed at short notice for safety reasons as a result of extreme weather or spring-like temperatures. Please keep an eye on the latest information. at www.breitachklamm.com. Heimatmuseum Oberstdorf The mountain village museum The “Heimatmuseum Oberstdorf” is located in a 17th century period property in Oberstdorf. Fortune has it that, despite a major fire in 1865 and the modernisation craze in the 1970s, the original core of the building is still intact. The museum opened in the historic premises in 1932 and has been continually ­extended ever since. Exhibits show how the destitute ­inhabitants of our mountain village survived, farmed the Alps, led visitors up into the mountains and learned how to ski. You will also find the largest leather ski boot in the world – shoe size 480, over three metres long and one and a half metres high. Only those who are aware of the past can understand the present. Fun and action for everyone on the Nebelhorn The NTC Park beside the Seealpe station on the Nebelhorn offers fun and action for all, bringing you winter sports in a very simple and entertaining manner. Whether on the tubing track, a snowbike, a skifox or an ­airboard, pure winter fun is guaranteed. There’s also plenty for kids to do on the Nebelhorn. In addition to the activities in the NTC Park, they can also look forward to exciting and diverse themed descents, such as the forest adventure track. Admission prices for the winter fun are between € 9 (1 hour) and € 25 (1 day). The NTC Funpark is open in winter from 9:30 a.m. to 4:30 p.m.
Snowbiking Want the sensation of riding a bike in the snow? Why not! On a snowbike, you can instantly conquer the mountain! Around 100 snowbikes are available to groups, families and individual visitors in the NTC Park on the Nebelhorn. After a short instruction session from the NTC guides, you’re ready to go. You don’t need ski boots and will very quickly be able to enjoy the gentle pistes close to the Seealpe station. What’s more, you’ll also be giving your back, upper body, stomach and legs a great workout. Thanks to the low centre of gravity, the risk of falling is much lower than in the case of alpine skiing. As the rider is not attached to the bike, there are no leverage forces like those when skiing or snowboarding. Kind on the joints and with a low risk of injury, this is a sport that’s even suitable for fit and active people of a more advanced age. Snowtubing on the Nebelhorn Oberstdorf’s longest snowtubing run is located at the Seealpe station on the Nebelhorn. The specially designed run offers fantastic fun for young and old. Families with kids will particularly enjoy a ­f un-filled day here, with lots of gloriously slippery downhill action. Two arenas – two opportunities for pure adventure Heini-Klopferski flying hill Idyllically situated in the Stillachtal Valley, the modernised Heini-Klopfer ski flying hill is a striking Oberstdorf landmark. It is one of just five ski flying hills worldwide and the only one in Germany. Enjoy the breathtaking view of the snow-covered-valley and the ­adjacent Freibergsee Lake from a height of around 72 m or follow the adventure trail around the site’s mountain station. The Ski Flying World Cup, which takes place from 1 to 3 February 2019, will be an exciting highlight in the competition calendar. Further information can be found on page 63. Audi Arena Oberstdorf A visit to the Audi Arena is a must. The Audi Arena with its five jumps at the foot of the Schattenberg, where the opening jump of the Four Hills Tournament takes place every year, is always worth a visit. The hillside lift takes you up to the foot of the jump tower, from where the panoramic lift continues to the viewing platform. The arena is open daily from 10 a.m. to 5 p.m., with a guided tour commencing at 11 a.m. (minimum group size: 8, booking required). Further information can be found on page 61. Use your very own activity book to join me, Nordi the little squirrel, on a journey of discovery and experience lots of exciting things during your holiday. Which animals live in Oberstdorf’s forests? Where is the best playground? Which is your favourite hiking trail? And much more. Successfully collect at least 10 stickers and answer all the questions to receive a little surprise from the Tourist ­Information Offices in Oberstdorf and its districts. And don’t forget: my activity book is valid indefinitely, so you can enjoy adventures and busily collect stickers over the course of several holidays – in both summer and winter. So, I’m crossing my fingers for your success and hope you have lots of fun with the puzzles and our discoveries! Come together to have fun, be creative and experience Oberstdorf – a varied programme for big and small. The brochure is available from all Tourist Information Offices in Oberstdorf and its districts. tandem flight with an experienced pilot is the ideal solution. Have you ever flown through the crystal-clear air over the snow-capped Oberstdorf mountains? In Oberstdorf, ­w inter certainly doesn’t stop the paragliders. Take the ­opportunity to experience Oberstdorf’s spectacular w ­ inter landscape from above. A list of providers can be found on page 77. Hang-gliding and paragliding enthusiasts find the best conditions in Oberstdorf. Whether big, small, young or old – tobogganing is always great fun! Oberstdorf has several extremely leisurely tobogganing slopes in picturesque settings near to the village, which are particularly ideal for children and infants. With sun terraces and eateries overlooking the slopes, parents can relax too! However, Oberstdorf also has plenty to offer sportier tobogganists as well. An der Halde Total length: 10 m Options for breaks: village eateries on the Oststraße Hire: next to the Nebelhornbahn cable car The tobogganing slope near the village is perfect for young children and located right next to the cross-country skiing trail. The ideal choice for a short excursion with the whole family. The Nebelhornbahn cable car whisks you up to the Seealpe station at 1,380 metres. From here, get ready for your swift descent down the natural toboggan run. The route provides stunning views of the entire village, inviting you to slow down a little to enjoy them. If one go simply isn’t enough, the Nebelhornbahn valley station is just a couple of minutes’ walk from the end of the toboggan run. The cable car also offers special tickets for tobogganists. Total length: approx. 800 m Options for breaks: Karatsbichl café and restaurant The sunny tobogganing slope at the edge of the village ­offers fun for all the family. The Karatsbichl is only about an easy 30-minute walk from Oberstdorf. Parents and ­companions can while away their time on deckchairs on the terrace or enjoy coffee and cake in the café while ­keeping an eye on the little ones. Cross the Dummelsmoosbrücke Bridge to the start of the meadow path towards Rubi. Here, the groomed natural toboggan slope is slightly hidden behind the dairy farm. Adults accompanying children can enjoy a clear view of the toboggan slope from below. The proximity to the village and the afternoon sun make this the ideal destination for a short toboggan excursion after lunch! After ascending to the Gaisalpe, take the Wallraffweg or go directly to the Reichenbach area and you will be ­rewarded with a fun toboggan ride. The cosy Gaisalpe restaurant is an inviting place to stop for a break before your descent. This long toboggan run with its tight bends and exciting route guarantees ultimate fun in the snow! For toboggan hire, see page 78.
also offered in the Tiefenbach and to the Rohrmoostal Valley. If interested, please contact the carriage-driving company in Tiefenbach directly. Rides also start from the Oberstdorfer Käsladen cheese shop, where you can obtain tickets and information directly. Departure time: in winter, approx. 10:30 a.m. (meeting point: Megèver Platz by the Kurpark). Arrival: back in Oberstdorf by approx. 3 p.m. Bookings are not normally required but are recommended in peak season. A list of all providers can be found on page 78. Oberstdorf’s side valleys and districts promise nature at its best and wild village romanticism Nestled between steep mountain forests, the valleys are closed off to excursion traffic and offer completely un­ disturbed peace and quiet in a wild and romantic natural setting. The most stunning hiking and excursion opportunities invite you to explore. In the Stillachtal Valley, you will not only find Germany’s most southerly inhabited village of Einödsbach but also the beautiful hamlet of Birgsau. Further attractions include the Fellhornbahn cable car and the Heini-Klopfer ski f­ lying hill, which gleams brightly in its newly renovated form, ­inviting you to come for a visit. The neighbouring Trettachtal Valley also has ­plenty to offer. Not only do the mountain farmers’ village of Gerstruben and the Christlessee Lake make this a popular destination, but the pretty hamlet of Spielmannsau also invites you to enjoy a leisurely hike. You’ll pass by the Kühberg en route to the Oytal Valley. The tree-lined lane takes you to the Gasthof Oytal restaurant, where the valley widens to offer a panoramic view of the mountain landscape. The romantic Rohrmoostal Valley – with southern Germany’s oldest wooden chapel – is also worth a visit in ­winter. Located in the Tiefenbach district, this hiking paradise has long-since belonged to a principality. Yet it is not just the Rohrmoostal Valley, but also the impressive Breitachklamm Ravine that make the picturesque district of Tiefenbach well worth a visit. The districts of Rubi, Reichenbach and Schöllang are ­characterised by peace and tranquillity. Located at high ­altitude above Reichenbach, the Gaisalpe restaurant offers spectacular views of the Allgäu Alps in both summer and winter. Rubi is known for its long hours of sunshine and many cosy eateries. Not far from Schöllang is a picturesque mountain church, where you can enjoy a breathtaking view of the area. The district of Kornau, located above Oberstdorf, offers fantastic views to the south. This village is characterised by cosy, private accommodation and historic chapels. A tradition-steeped and sports-loving village with many different facets. Village life is shaped by multiple events, with winter sports, in particular, enthusing visitors and locals alike. When the houses in Oberstdorf’s pedestrian area are ­covered in snow, the sun shines in the narrow lanes and the shop windows are filled with enticing offers, nothing stands in the way of some winter shopping. sportswear and equipment, you’ll also find plenty of health and skin care products. From cosmetics to foot care to the right nutrition – there’s plenty to choose from in Oberstdorf. And if you’ve still not had enough of shopping, the numerous fashion retailers and shoe shops are sure to offer you the perfect outfit for a meal at a restaurant or a night on the town. If you need a break while shopping, Oberstdorf also has plenty of cosy cafés, rustic village inns and stylish restaurants, where you can relax, quench your thirst and sate your hunger. As the time comes for cosy winter evenings, customs start to come alive in Oberstdorf. These include one of the oldest custom, the Allgäu “Klausen” processions. When people’s fears of evil spirits overpowered them on dark nights, the young Oberstdorf locals dressed up in fur garments, put on fur-covered heads with deer antlers and ran through the narrow streets, rattling chains to drive away the evil spirits. For many years, only long-established Oberstdorf locals were allowed to join in. Today, this rule is no longer quite as strict. And it’s no longer only evil spirits that are hunted. Instead, it’s cheeky young ladies and curious spectators. On 6 December, the “Klausen” take over the Oberstdorf streets. Two days beforehand (on the feast of St. Barbara), the women of Oberstdorf meet at nightfall. They don traditional everyday clothing from days gone by and head for the women’s procession, known as the “Klausenbärbel-­ Treiben”. i Please note During the event, the Trachtenverein Oberstdorf (Oberstdorf Traditional Costume Association) ensures that things don’t get out of control. Despite this, the Klausen day is not everyone’s thing and even the locals often prefer to observe the spec­ tacle through the window from the comfort and warmth of their own home. In particular, children and those unfamiliar with the custom should heed this advice! Please also note that the public infrastructure companies close by no later than 6 p.m. on these days and 98 % of gastronomy ­establishments are closed on these evenings. groups such as alpine horn blowers, yodellers or the Oberstdorf town band also contribute to the merry atmosphere. You can also look forward to hearing singers in traditional costumes, dulcimer music, readings and poetry in local dialect. At the start of Lent, on the first Sunday after Fasnacht (Carnival), huge bonfires light up the night sky in many open areas around Oberstdorf. The origins of this ancient custom are still unclear and there are many possible explanations. Some associate the bonfires with the many Easter and Midsummer fires and say that they burn all things wicked at the end of winter in order to strengthen the sun and ward off evil. This explains why a straw witch is symbolically set alight. Others associate the event with the fertility rituals and burnt offerings of the Celts. Today, Bonfire Sunday is a sociable occasion that’s great fun to watch as the tall wooden pyres go up in flames and blaze away against the night sky. Funke-Kiechle The deliciously sweet “Funke-Kiechle” are a firm favourite with visitors and locals alike and an integral part of any Bonfire Sunday celebrations. These tantalising, fried treats are only available on this one day. They are best washed down with a cup of hot mulled wine and enjoyed in good company around the fire! Cosy eateries in Oberstdorf A warm welcome from friendly owners awaits you not only in the village centre and the areas around Oberstdorf but also up on the mountains, in the valleys and along the many hiking trails. Whether rustic inns, cosy cafés or gourmet restaurants – numerous gastronomy establishments invite you to sit back and relax as you enjoy regional and international ­specialities that tantalise the taste buds. From tasty coffee and cake on a sun terrace, to a hearty snack washed down with a typical, freshly pulled Allgäu beer, through to high-­ quality speciality game dishes accompanied by a fine wine. Not only down in the valley but also up on the mountains, the owners of rustic mountain huts, modern mountain restaurants and parasol bars all look forward to your visit. Delight in the aroma of hot mulled wine and the warmth on your hands during a short break or take things down a gear and relax on a large sun terrace while enjoying the clear mountain air and huge range of culinary delights! See the world’s best winter sports athletes and experience the emotions of competition at first hand – in Oberstdorf, a romantic winter village atmosphere combines with the excitement of major sporting events. However, in addition to top-level sports, there’s also plenty of entertainment to cater for all tastes. No-one can escape the magic of the Winterfest Oberstdorf (Oberstdorf Winter Festival). Enjoy the evening with a mug of mulled wine, a hot Caipirinha or a traditional punch and try the Allgäu delicacies and culinary delights on offer from our local establishments. From 7:30 p.m. each evening, our top live bands generate a merry atmosphere and that party feeling. The longest outdoor bar in the Allgäu opens at 8 p.m. and our DJs show that they really know how to party by keeping things pumping till 3 a.m. in the morning. The fifth Ladies’ FIS Ski Jumping World Cup will bring the competitors to the large hill in the Audi Arena Oberstdorf for the final test in the Nordic Ski World Cup in Seefeld. Four individual competitions will take place on the Arena’s HS 137 ski jumping hill. Following a successful last season, Carina Vogt, Katharina Althaus and the rest of the German competitors will be eager to chase down victory during this stage of the World Cup on their home turf. Standing in their way is Sara Takanashi from Japan, who has won no fewer than six of the eight previous titles. And there’s little doubt that the competitors from the other nations will also be on top form coming up to the World Cup. F urther information about the event can be found at www.skispringen-damen.de or by calling the information hotline on +49 (0) 83 22 / 80 90 300. A classical technique mass-start race on 2 January, followed by a freestyle sprint race on 3 January await the contestants in Oberstdorf. These provide the ideal opportunity for the favourites to gain time advantages over their competitors on the Burgstall, the notoriously difficult section of the arena. The organisers in Oberstdorf are delighted to have the chance to once again stage two attractive races in 2019 as a fixed part of the tour. Full information about the Tour de Ski in Oberstdorf can be found at www.tour-de-ski.info or by calling the information hotline on +49 (0) 83 22 / 80 90 300. Further information about the event can be found at www.skifliegen-oberstdorf.de or by calling the information hotline on +49 (0) 83 22 / 80 90 300. World Champion both on the slopes of the Schattenberg and on Ried’s cross-country skiing trails. That means plenty of excitement and lots to do for visitors to Oberstdorf over the days of the competition. To be sure you don’t miss out on this winter sports highlight, come back to visit Oberstdorf again in 2021! guides. Or take an opportunity to head out on a guided full-day winter hike. Of course, there are also plenty of other exciting things on the agenda for Nordic Week in Oberstdorf. Info: For detailed information about the events, visit www.oberstdorf.de/nordic-week Booking: Tourist Information, Oberstdorf Haus Advance tickets Prinzregenten-Platz 1 Tel. : +49 (0) 83 22 / 700 - 21 00 Bookings must be made by 3 p.m. the previous day. ... and make your holiday to something very special. Disabled access as a mark of quality and convenience at three Â­altitude levels. Holidays for all people and all needs. With transport facilities, accommodation and leisure activities that are accessible and suitable for those with a disability, as well as allergy-friendly facilities, Oberstdorf is breaking down barriers. Disabled-friendly “travel for all” Germany has introduced a nationwide certification system for all areas that offer “Disabled access as a mark of quality and convenience” – and Oberstdorf has earned its official stamp. coordination with the relevant associations and tourist operators. F or further information and a list of certified companies as well as leisure services in Oberstdorf, please visit www.oberstdorf.de/barrierefrei and see our feel-good brochure. Foundation (ECARF). The certified quality of these companies is indicated by the combined BHV-ECARF logos. The criteria that have to be met by the participating companies lead to a vastly reduced level of contact with the most frequently occurring allergens. F or further information and a list of certified companies in Oberstdorf, please visit www.oberstdorf.de/allergikerfreundlich and see our feel-good brochure. With a wonderfully mild climate, outstanding air quality and an untouched natural landscape, Oberstdorf has been regarded as a climatic health resort since 1937, receiving the accolade of the Premium Class label in 2002. Oberstdorf has been a recognised Kneipp location since 1964. The Kneipp-based understanding of a healthy life and natural healing looks at the person as a whole and aims to maintain or restore good health. In a climatic health resort, nurturing and stimulating factors can be administered in such a way as to support people’s health. Negative ­factors are largely excluded. In recent times, regular fine dust measurements have also been introduced to guarantee high air quality. Thanks to consistent traffic calming measures, targeted urban planning and forestry programmes, we can still live in harmony with nature. In addition to the commitment to a healthy climate, P ­ remium Class locations also take care of nature in all other respects. For example, they primarily use local products in order to protect their own landscape. It is with good reason that Oberstdorf is one of only a small number of healing resorts in Germany to have been twice awarded highly sought-after certifications as a climatic health resort and a Kneipp resort. As such, Tourismus Oberstdorf offers you a very special service to enable you to optimally plan your holiday and your health requirements. A Euro-key can be borrowed or purchased from the café in the Oberstdorf Haus or the Oberstdorf Tourist Information Offices for a € 25 fee or deposit. A list of providers of disabled equipment and wheelchair emergency services can be found on page 76.
integrated loop. These signals are ­received by hearing aids (set these to position “T” or “MT”). This minimises ambient noise and improves the quality of the advisory services. Anyone wanting to use this system will find a fully equipped help desk at the back of the Tourist Information Office in the Oberstdorf Haus as well as at the Tourist Information Office at the railway station. The counter is ­labelled with a clear pictogram in each case. Visitors who use a wheelchair can now be served at eye level by Tourist Information Office employees at the disabled-friendly counter in the Oberstdorf Haus. This counter is ­freely accessible for wheelchairs and makes it easier to provide advice. This counter is also labelled with a clear pictogram. The Nebelhornbahn and Fellhornbahn cable cars as well as the hiking routes to Rubi, into the Trettachtal and Oytal Valleys and to the ski flying hill have all been checked and certified by “Reisen für Alle”. Please note, however, that the winter weather is likely to cause restrictions to the fully accessible nature of these. 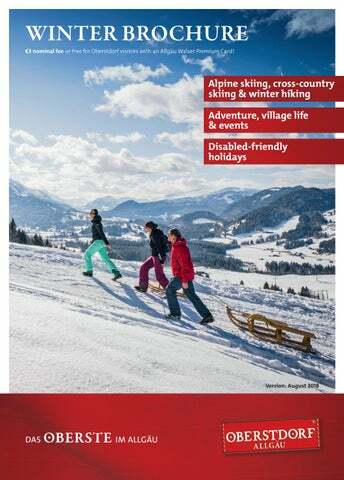 Whether you’re looking for contact details or p ­ ractical advice, helpful information for planning your holiday or tips on what to do while here, this section offers plenty of great information for your holiday in Oberstdorf – all compactly presented and quick and easy to find. The “MeinFlixbus” makes daily journeys to Oberstdorf from Berlin via Nuremberg. The journey time is 6 hours from Nuremberg to Oberstdorf and about 11 hours from Berlin to Memmingen. Take the A7 Flensburg-Füssen motorway to exit 136 Dreieck Allgäu (Allgäu Interchange), then continue on the A980 motorway to the Waltenhofen exit. From there, take the B19 to Oberstdorf. Take the B12 from Lindau/Isny to the Waltenhofen exit. From there, follow the B19 to Oberstdorf. Getting here by bus Door to door service. The professionals from the “Komm mit” bus service will collect you from your home and take you reliably, safely and comfortably to your accommodation in the Allgäu – and all for a very affordable price. F or contact details, see page 76. Visitors staying for several days can purchase Oberstdorf holiday tickets for 4, 7 or 14 days. These are valid on all buses and trains (excluding IC trains). Children under the age of 15 can travel free when accompanied by a parent. When staying in Oberstdorf, you will receive an Allgäu Walser Premium Card on your arrival. This is an Oberstdorf visitor card, which is provided by your host and entitles you to receive an array of free and discounted services. Holiday tickets are valid on buses and trains throughout the southern upper Allgäu region as well as in the Klein­ walsertal Valley. Holders of an ID card for the severely disabled with a valid travel token and the designated carer accompanying them can use the local public transport free of charge (excluding the Kleinwalsertal Valley and excursions). Without a travel token, only the accompanying person is free. Further information about the benefits of the Allgäu Walser Premium Card and how to use it can be found in the “MehrWERT” (“Added value”) leaflet obtainable from your host, in any Oberstdorf Tourist Information Office or online at www.oberstdorf.de/tourist-info. Oberstdorf ski bus The ski bus to and from Oberstdorf’s Nebelhorn, Fellhorn and Söllereck ski resorts is free of charge for skiers, snowboarders and cross-country skiers in the municipality. To be eligible, you must be carrying alpine skiing, snowboarding or cross-country skiing equipment. Ski passes alone do not entitle you to free transportation. F or a list of bus providers and taxi companies, see page 76. Ski schools A list of ski schools can be found on page 18. Ski hire A list of ski hire options can be found on page 18. The Oberstdorf Tourismus website offers you inspiration and ­information for your winter and summer holidays, including an extensive accommodation search. The Oberstdorf app for android and iOS enables you to take all the holiday information you need out and about with you. You can naturally also find us on social networks. Join the ­Oberstdorf community!